When Bob Williamson first arrived at Alta Lake (now Whistler) in February of 1930, he found himself in a valley bearing little resemblance to the bustling resort town of today. Even getting there was a completely different experience. Bob Williamson at work on the transmission lines, well before Alta Lake was able to access the electricity they carried. Smith Collection. For most people, travel was confined to four days of the week: north on Mondays and Thursdays, south on Wednesdays and Saturdays. Passengers travelling from Vancouver would leave on a Union Steamship at 9 am and, after switching to a train in Squamish, would arrive at Alta Lake about 4:30 pm. The view of Brandywine Falls clearly shows the railway bridge which provided a unique view to passengers. Philip Collection. When Bob’s wife Florence (Flo) joined him at Alta Lake in September, the pair travelled south, leaving their car in Lillooet and taking the train the rest of the way. During the summer months a couple of special trains were added to the usual schedule. An excursion train on Sunday ran from Squamish to Alta Lake and back and a Fisherman’s Special headed north to Lillooet on Saturday and back south on Monday. Later, a third through train was added going north on Wednesdays and south on Fridays. Today, the only trains that come through Whistler are either freight or the Rocky Mountaineer. Those that passed through the valley in the 1930s were mixed trains, carrying a combination of freight and passengers. They stopped at various restaurants along the way, including Rainbow Lodge when heading south, to provide meals for passengers until dining cars were added later in the 1930s. A southbound PGE train pulling in to Rainbow Lodge. Jardine Collection. Alta Lake had two railway stations, the Alta Lake Station at Mile 37 and the Rainbow Lodge Station at Mile 38. Mileages were measured from the Squamish dock, where the railway began (when the railway was extended to North Vancouver in 1956 the mileages were changed to read from there, creating some confusion when looking at older documents). Bob and Flo rented a cabin from Bill “Mac” MacDermott on the south end of Alta Lake. As Mac usually rented his cabins out to summer visitors, he had to do a bit of winterizing when the Williamsons moved in year round. By 1934, with the addition of a generator, a pump for indoor plumbing, a gas-powered washing machine and a propane fridge (possibly Alta Lake’s first refrigerator) Bob and Flo were comfortably settled. Life at Alta Lake had quiet periods, but Bob remembered some exciting moments as well, one of which arrived on the train from Pemberton. A woman was on her way to Vancouver to have her baby, but made it only as far as Rainbow Lodge. Grace Woollard and Grace Archibald in the Cheakamus Canyon on their way to Alta Lake, 1912. Clarke Collection. There she gave birth to twins, a boy and a girl. As Bob recalled, the boy was named Philip for Alex Philip and the girl Grace after Grace Woollard, a retired nurse living at Alta Lake who helped with the delivery. In 1942, Bob and Flo left Alta Lake for Lillooet and a promotion within the railway. By that time, float planes had started arriving in the valley, but the railway remained residents’ main connection between Alta Lake and the outside world. Ever found yourself lost in Whistler Village? The unique flow of Whistler Village was actually one man’s specific intention! On our one hour tour you can learn more about him and many others who have helped to shape Whistler as it is today. As we wander through Whistler Village you’ll uncover Whistler’s start as a fishing lodge, tales behind the mountain development, and our long journey to the 2010 Winter Olympic and Paralympic Games. The tour is approximately one hour long. Each tour is led by a long-time local, each with their own personal knowledge to add to Whistler’s story. Whether you’re visiting us, here to work for the season or have lived here for years we guarantee you’ll be sure to learn something new. Do you know how Whistler and Blackcomb mountains got their names? Or when the first Olympic bid was placed? This is your chance to find out the answers to these questions and so many more! Valley of Dreams Walking Tours occur every day at 11 am in June, July and August. Meeting outside the Whistler Visitor Centre on Gateway Loop, these daily tours are offered by donation. We are more than happy to provide private tours outside of these times or for groups. Simply contact the museum to book a private tour, preferably at least a week in advance. With sufficient notice we can also customize content and routes to meet your group’s specific interests and needs. For all tour-related inquires please call the Whistler Museum at 604-932-2019 or visit us behind the library. You might not have heard of it, but this Monday, March 19 is a holiday unique to Whistler. On March 10, 1986 the council of the day voted to declare March 19 “Myrtle Philip Day” in honour of Myrtle Philip’s 95th birthday. Myrtle and Alex Philip first came to the Whistler valley, then still known as Alta Lake, in 1911 and opened Rainbow Lodge in 1914. Over the next 30 years their success at Rainbow Lodge helped turn Alta Lake into a summer destination. When the pair sold the lodge in 1948 they had planned to move on but, like many who came after them, they never quite left. Myrtle and Alex Philip stand outside Rainbow Lodge in the 1930s. Philip Collection. After Alex’s death in 1968, Myrtle remained at her cottage on Alta Lake and continued to take an active part in community life. She moved into Hilltop House in Squamish for only the last few years of her life. Recognizing Myrtle’s birthday was nothing new for Whistler: almost every year her birthday celebrations were reported in the local papers, including The Whistler Question and The Citizen of Squamish. Myrtle’s 90th was marked by a grad celebration at Myrtle Philip School attended by about 200 well wishers, including her two sisters and nephews and nieces. The students of the school presented Myrtle with 90 daffodils and the Gourmet Bakery prepared a 99-inch cake for the occasion. Presentations were also made by Pat Carleton, the Whistler Rotary Club, the Whistler Chamber of Commerce, School Board Chairman Jim McDonald and the staff of Myrtle Philip School. Pat Beauregard, on behalf of the Alta Lake Community Club, presented a plaque representing the newly created “Myrtle Philip Award,” awarded each year to a student demonstrating academic excellence. This award is still presented today. 89-year old Myrtle Philip cuts her birthday cake at her party. Whistler Question Collection. Given the community’s respect for Whistler’s “First Lady,” it is no surprise that her 95th birthday warranted her very own day. This was not, however, the first Myrtle Philip Day celebrated in Whistler. On October 13, 1974, friends, former guests of Rainbow Lodge and others who knew Myrtle gathered at the still-standing Rainbow Lodge to remember their days at Alta Lake. Officially called “Myrtle Philip, This Is Your Life” day, the event was described as a “time when old friends and former guests of Rainbow return to the lodge” for a party that lasted from the train’s arrival to its departure. The railway even planned to reserve an “old-time railway coach” to transport the party guests. Myrtle Philip and Mayor Mark Angus celebrate her 93rd birthday. Philip Collection. The official declaration of “Myrtle Philip Day” in 1986 was only one of the gifts Whistler gave Myrtle that year. She also received a birthday cake, flowers, gift baskets and even a special Myrtle Philip cookie from Germain’s. Tapley’s, which bears her family’s name, put up a birthday banner for the day and Mayor Terry Rodgers made a trip to see Myrtle in Squamish. Unfortunately, this was also Myrtle’s last birthday. That summer she died of complications following a stroke and was buried in the Whistler Cemetery. The community continued to celebrate Myrtle Philip Day, hosting fundraisers and handing out birthday cake in her honour. The Barnfield family is best known in Whistler as the owners of a dairy farm that once operated where the Barnfield neighbourhood is located today (read more about that here). The farm was moved south to Brackendale in 1926, though the family continued to bring the cows and chickens back to Alta Lake for the summer tourist season. Vera Merchant, the only daughter of the Barnfield family, continued to come up for summers even after her family had stopped bringing up the farm and worked at Rainbow Lodge for three seasons. Her recollections provide a unique view of Rainbow Lodge and Alta Lake during the mid-1930s. Daisy Barnfield (Vera’s mother) feeds the chickens with some help from the children. Although Vera worked at Rainbow Lodge in 1934, ’35 and ’36, her experiences seem familiar to anyone who has worked in Whistler’s busy tourism industry. During the summer, employees at Rainbow Lodge didn’t get many days off. Vera was paid $25 a month and was provided with room and board. This meant that she and another girl (also coincidently named Vera) shared a small two-bedroom cabin at the lakefront. Though we don’t know which cabin, Vera and other employees at Rainbow Lodge were lucky enough to get lakeside accommodations during the summer. Vera’s work included cleaning cabins, setting and clearing the dining room and leading activities such as hiking and horseback riding with guests. 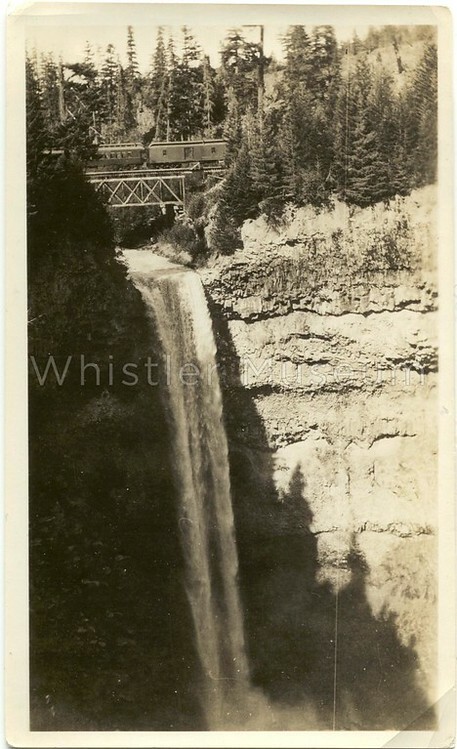 On Sundays, the Pacific Great Eastern Railway ran excursions where passengers could come to Alta Lake just for the day. These excursions were dreaded by Vera and her coworkers as they would have to rush to set up the dining room for lunch for guests and then again for day trippers and then reset the tables in time for dinner. The staff did not eat until after the guests had finished their meals and the tablecloths, dishes and food had been put away. Though most of the guests at Rainbow Lodge kept their cabins relatively clean, Vera remembered some cabins were left “an awful mess.” A few times cabins were covered with “lemon peels and gin bottles and… no broken glass, but liquor all over the floor.” When Vera showed the cabins to Alex Philip, who she suspected of being in on the previous evening’s party, he assured her that she would not have to clean up the cabin and that he would have the guests take care of their own mess. Vera Barnfield (far left), Alex Philip and two unidentified women, possibly Rainbow Lodge employees, wait for the train at the station. Despite working hard in the cabins and dining room, Vera enjoyed the work at Rainbow Lodge. She and the other girls she worked with would go to the dances at the schoolhouse and the next day employees and guests would ride to the Green River for a picnic breakfast on the bridge. Mason Philip, Alex Philip’s nephew, would go ahead with the faster riders and the horses with the supplies and Vera would bring up the rear with the guests less comfortable on horseback. By the time Vera and her group arrived the table was set, the fire was going and food was already being prepared. A full breakfast was provided, including eggs, bacon and hotcakes. Vera loved being surrounded by the trees and the glacier water of Green Lake (her personal record for swimming Green Lake was five minutes). Vera only worked at Rainbow Lodge for three years before her marriage but her summers at Alta Lake, both as a child with her family’s dairy and as a young woman with the Philips, provided memories that stayed with her until her death in 2014, just seven weeks before her 99th birthday. It’s a story everyone in Whistler has heard – young person comes to the valley to work for a season, but ends up staying a few years longer than expected. What makes the story of Mollie Stephenson unique, however, is that she first came to the Whistler valley in the summer of 1926. Mollie Stephenson at Rainbow Lodge, 1929. Philip Collection. Mollie enrolled at Normal School (what teacher college used to be called) but was unable to attend as a bad chest cold turned into bronchitis and her doctor prescribed a drier climate. Alex and Myrtle Philip were advertising for girls to work in the dining room and Mollie left for Alta Lake in May of 1926 intending to attend Normal School in the fall. Life at Alta Lake soon cleared Mollie’s cough and in July she transferred from the dining room to work as a wrangler and guide for the rest of the summer. Each day she would spend 12 to 14 hours out in the forest with the 15 horses Rainbow Lodge had use of. Trail rides were popular with Rainbow Lodge guests and Mollie would often take groups for breakfast at Lost Lake, Green Lake or near a stream. Lam and Sam, the cooks, would pack ingredients and every rider was given a job, whether building a fire, making the coffee or preparing the pancake batter. By the time the food was ready everyone in the group would have a hearty appetite. A picnic during a ride included a tablecloth and china as well as jobs for every guest. Philip Collection. When September arrived Mollie was already looking forward to her next season at Rainbow Lodge and instead of returning to Normal School in Victoria accepted a temporary job at the Uppingham School kindergarten in Oak Bay. Mollie Stephenson pretending to ride a foal at Rainbow Lodge. Philip Collection. By June Mollie was once again en route for Alta Lake where she found a few changes: George Thompson was now manager of Rainbow Lodge and Pearl Thompson had taken over the post office. (Over 60 years later Mollie and George married – she was 83 and he was 90.) Luckily George had bought the horses Mollie had previously worked with for continued use by Rainbow Lodge. Again Mollie worked as a wrangler and guide. Early in the season a man arrived at Rainbow Lodge asking about an abandoned copper mine. Mollie had found the mine the previous year while exploring the trails on the mountains and offered to guide him there. He brought in a crew and made a deal with George to use packhorses to bring in mail and supplies. Three from Mollie’s group were picked: Danger, Ginger and Dark Devil. While taking the horses up to the mine one day Ginger, who happened to by carrying the explosives, got caught between two trees. Mollie had been warned by one of the PGE rail crew to be careful of any sudden blows or jolts to the packs containing the dynamite and she was terrified while working Ginger out from the trees. Mollie arrived at the mine and recounted her harrowing adventure over lunch, proud of having gotten herself out of a dangerous situation. What she didn’t expect, however, was for her tale to be greeted with laughter from the men at the camp. She soon discovered that the warning of the PGE rail crewman had been a joke at her expense; the sticks of dynamite and the caps were kept in separate packs and Ginger had never been in danger of exploding. I loved swimming, although racing never appealed to me. Swimming for miles was like an interesting hike but on the water. I had been swimming across the lake all summer, although never the length of the lake. One day a couple of naval officers staying at the Mons Hotel asked Alex Philip if any of his guests would join them in a friendly race from McDonald’s cabin, at the south end, to the River of Golden Dreams, at the north end. Alex approached me. I explained that I wasn’t into fast swimming or racing, but as there were no other contenders I would swim along with them, on condition that they didn’t expect me to win. Soon they were ahead, but when we were more than half way across we hit an unexpected glacial current that took one’s breath away. At this point the fellows had had enough and headed to the beach. The “tortoise” kept on going until I walked onto the beach at the River of Golden Dreams. There was a huge bonfire burning and Myrtle had a warm blanket to wrap me in. My prize came after dinner when the two officers asked me to dance with them! Mollie spent several summers at Rainbow Lodge and, like many who have come after her, unexpectedly fell in love with the area and its outdoors lifestyle. Though she went on to marry and live elsewhere, Mollie will always be remembered as one of the first seasonal workers who just couldn’t keep away from the Whistler valley. In 2010 Mollie’s daughter sent the museum part of an autobiography that her mother wrote, including information about her time at Rainbow Lodge. The bulk of the information we have about Mollie Stephenson comes from her own writing. If you take a walk along the Village Stroll in December you’re sure to notice signs of the holiday season anywhere you look; there is snow on the ground, tree are lit up, wreaths have been hung, and beneath the voices of crowds of people strains of holiday music can be heard. As in many communities, music plays an important part in Whistler’s holiday traditions, many of which began in the 1980s when the Whistler of today was still developing. Events such as the Bizarre Bazaar (now the Arts Whistler Holiday Market) would not be complete without festive music in the background and for thirty-three years the Christmas Eve Carol Service has brought local residents and visitors together to sing carols as one community. Though rarely performed, Whistler even has its own Christmas musical. Molly Boyd with Myrtle Philip at the first performance of “Christmas at Rainbow Lodge”. “Christmas at Rainbow Lodge” was written by Bob Daly and Molly Boyd and first performed by the students of Myrtle Philip School in December 1984. Daly was the principal of the school from 1981 to 1985 and returned to head the school twice more before retiring in 2002. During her twelve years living in Whistler, Boyd was heavily involved in Whistler’s music scene and its holiday activities – she founded the Whistler Children’s Chorus, was involved in starting the Christmas Eve Carol Service and directed the Whistler Singers. During December she could often by spotted leading the Singers caroling through the Village with here battery-operated keyboard balanced on a shopping art. The two were inspired to create a musical by Myrtle Philip’s stories of her life as a pioneer in Alta Lake as told to them over tea and Myrtle’s famous rum cake. The musical tells the shortened and somewhat fictionalized story of how Myrtle and Alex Philip came to build Rainbow Lodge, beginning with Alex’s chance meeting of John Millar in Vancouver in 1911. The story includes their first three-day journey to Alta Lake and meeting with loggers, trappers, railroad workers, miners and hunters who already lived or were working in the area. Each group of people the pair meets helps them in some way as they begin settling and building. To thank all these people for their kindness they all are invited to share in the Philips’ first Christmas at Rainbow Lodge. The dining room at Rainbow Lodge decorated for Christmas. Unlike many holiday concerts, most of the music in “Christmas at Rainbow” is not about Christmas. Instead, the majority are folk songs from the Pacific Northwest such as “Acres of Clams” and “The PGE Song”, many of which were collected by Philip J Thomas, a composer, singer, teacher and folklorist who founded the Vancouver Folk Song Circle and instrumental in collecting and preserving the folk music of British Columbia. Since its inaugural performance in 1984, “Christmas at Rainbow” has been performed only twice more: once by the students of the current Myrtle Philip Community School in the 1990s and once by the intermediate students of Spring Creek Community School in 2012. Happy Holidays from the Whistler Museum! The construction of Rainbow Lodge in 1914 is recognized as a seminal moment in our valley’s history, and deservedly so. But something else happened that same year that is equally important to the creation of a tourism industry and Whistler’s early history. When Alex & Myrtle Philip first visited Alta Lake in 1911, it famously took them three days to get here from Vancouver, by boat and on foot. That all changed with the completion of the first leg of the Pacific Great Eastern (PGE) Railway in 1914. The route to Alta Lake, pre-PGE. Myrtle & Alex Philip coming up the Pemberton Trail on their first visit in August 1911. Now, somebody leaving Vancouver early in the morning could ride a steamship to Squamish, transfer to the passenger car on the train right by the waterfront, and be at Rainbow Lodge in time for dinner. Not quite the speed of today’s Sea-to-Sky Highway, but a drastic improvement nonetheless. This was not just a nice creature comfort; this was essential for the nascent tourist trade. 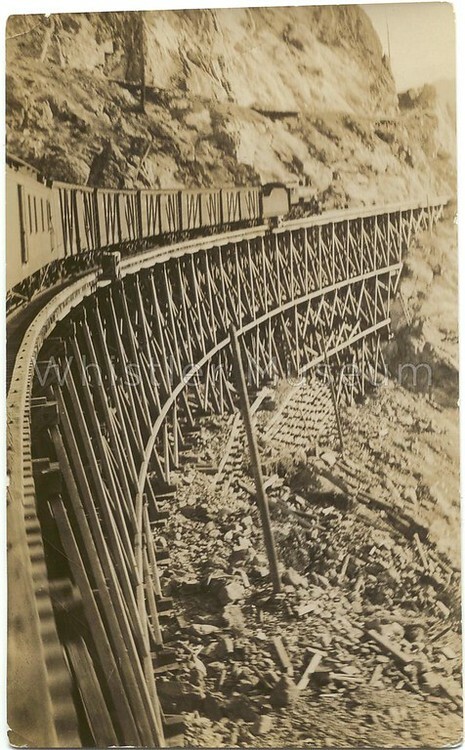 The rugged Cheakamus Canyon, roughly halfway between Squamish and Alta Lake, was the main engineering challenge confronted by the new railway. The railway was not built with tourism in mind. Linking Lillooet to Squamish (but not Vancouver), the PGE railway was built to service the heavier industries in the interior, particularly mining and forestry. Providing access to the coast was crucial for the development of a resource-based economy, as it allowed these heavy goods to be shipped overseas to market. Here in the valley, the railway led to an immediate increase in logging activity (think Parkhurst), and some mining operations (particularly iron and copper) got substantial enough to make use of the train as well. Despite its seminal role in our valley, the PGE was mis-managed from the start. In 1915 the owner’s of the privately-held railway began missing bond payments, and the province of BC took over ownership a few years later. Riders were treated to a spectacular view of Brandywine Falls. Regardless, it was a lifeblood of the early community of Alta Lake, not only bringing tourists, but provisions and supplies, transported locals to the city, and connected them to essential services that weren’t available here, like hospitals and (sometimes) schools. Waiting for the train with a full load of passengers, circa 1915. Myrtle (waving, in black dress near centre) and Alex (plaid shirt, to her right) greeting visitors at the train station, circa late-1920s. Coming or going? We’re not sure here, but either way, the Alta Lake train station was a welcoming place. Alex Philip at far left, in his trademark safari suit. Even with the completion of the highway from Vancouver in 1965, passenger service continued on the PGE until 2002, by which point it had long been renamed as BC Rail. Nowadays, there are frequent calls to restore and upgrade passenger rail service to Whistler and beyond, but there are a whole host of technical, logistical, and financial barriers making it an unlikely prospect.